See also Astrid's unsuccessful attempts to find a doctor in the Netherlands. Just wanted to tell you that I took up on your advice and went to see Dr. Maigne in Paris (see Doctors and specialists in France). First a dynamic x-ray was taken. The next day I had an appointment with Dr Maigne at the hospital in Paris next to the Notre Dame. I told my story (which he'd already read on this website...). Because I had huge pain passing from the sitting position to standing up, Dr. Maigne thought it would be a luxation. The x-ray showed a posterior luxation of the second vertebral body of the coccyx in the sitting position. 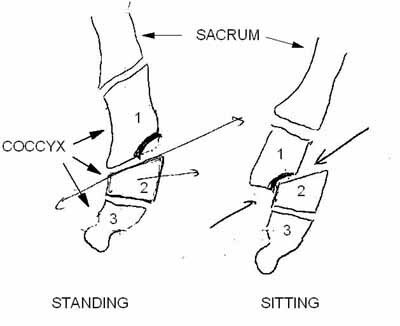 When standing, my coccyx is normal. 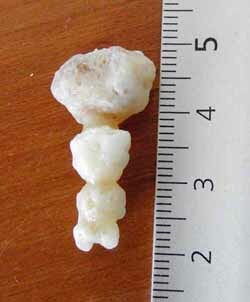 There is something interesting about my first vertebra: there is a notch at the corner. So when I want to stand up, the second vertebra is trapped into this notch. This is the acute pain when passing from the sitting to the standing position. Dr Maigne made a understandable drawing of my coccyx to show my GP and everybody at home (see above). He also said that I would be a good candidate for surgery. The same afternoon Dr Maigne did a discography (with a spinal needle of 10 cm...) which was a uncomfortable procedure. He also injected hydrocortisone which may (or may not) take the pain away. It is now three days after the injection and the pain isn't gone. Maybe that is because Dr Maigne pushed on my coccyx when positioning the needle and that that is the pain I am feeling. The acute pain when passing from sitting to standing is not gone, but different. Or maybe the trip from Paris to the Netherlands (by train) is still in my system? The cortisone injection given by Dr. Maigne at December 13th started working four weeks after. I was glad to feel no more pain! Strange to feel nothing after half a year of daily pains. But sadly enough, it only lasted for three weeks. The pain is back and is getting worse every day. Sitting up straight on the sofa is terrible! I can only sit on one cheek and shift from one to the other. My hips are getting painful as well. I contacted Dr. Maigne by e-mail and he gave me two options: another cortisone injection which could give longer pain relief but no guarantee, or I could go for a coccygectomy, which in my case (severe luxation) has a 90% good results. The last trip (when I first saw Dr. Maigne) to Paris was painful. We went for a 5 hour trip by train. I don't want to do that again for 'just' a cortisone injection. If the second injection doesn't give any relief or for only a few weeks, I have to go to Paris again for the surgery. So, if surgery is inevitable, than let's go for it! Dr. Maigne doesn't operate himself. He recommended Dr. Doursounian who has done about 150 coccygectomies! My coccygectomy is scheduled at May 11th by Pr. Doursounian at the Hospital Saint Antoine in Paris. My husband will accompany me from the Netherlands. I'm not looking forward to the trip (6 hours) by car, but I don't have a choice. I have to stay 6 days in hospital after surgery to reduce the risk of infection to a minimum. I read on this website that some patients have to leave hospital the day after surgery. Depends on the country I guess? Well, I have all the confidence in Professor Doursounian; he has done more than 150 coccygectomies. I'm anxious and afraid at the same time. I'll let you know how it all went. On May 11th I had my coccygectomie. The last two segments of my coccyx has been removed by Prof. Doursounian (see picture - markings in centimetres). He said that he could easily remove the part because it was all loose! I didn't have much pain and today, 10 days after surgery I don't need any pain medication. A few more days and I can try to sit down, now I'm just laying down and walk (with no pain). Yesterday the stitches were taken out. My physician said that the wound looks very well. I have had no bruising. I was in the Saint Antoine Hospital in Paris for six days. Prof. Doursounian said that we had to be careful with infection. So every morning I got a new bandage. Going to the toilet wasn't and isn't a problem. I can easily clean it and there is no pain. I could walk the day after surgery without any pain. The incision was done between the 'cheeks' and my 'buttcrack' is now 5 cm higher. I have no problems with that. If anyone is thinking about coccygectomie and living in Europe....try to get help from Dr. Maigne and Prof. Doursounian. They're the best and the most experienced of all! Just a year ago I fell and broke my tailbone. Three months ago I had my coccyx removed in Paris, and now? I am so happy now! I'm 99% better than a year ago! Fantastic. Even the car trip to Italy (for 12 hours) was fine. I hardly had any pain. And when I lay down or walked a little, the pain was gone. You can imagine that I have no regrets having the operation done. Great work from Dr. Doursounian in Paris.